Karine Babasyan is among residents who say they're getting a bad deal.. Hundreds of Yerevan citizens rallied Thursday (January 29) to protest what they call unfair treatment by authorities administering the city's North Avenue project. 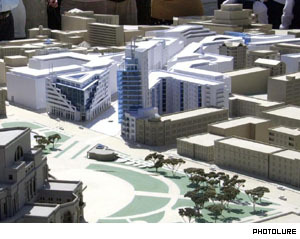 The urban renewal project which will connect Republic Square and the Opera House by a promenade of upscale businesses, restaurants and apartments, has forced many residents to move. And while the government is offering compensation for their property, residents complain that the amount offered is often not enough to purchase new homes of comparable size. 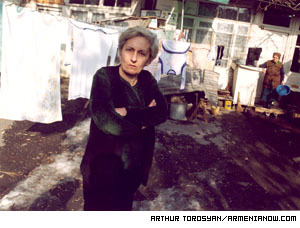 "How am I supposed to buy a house at that amount," cries Azghui Muradyan, a Lalayants resident. The amount in question is the $8,000 the municipality has offered for her 29 square-meter home. 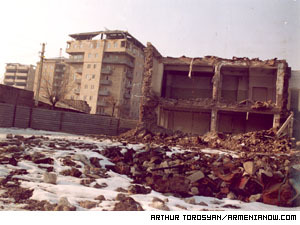 "It will not even by a one-room home on the outskirts of Yerevan," Muradyan claims. According to M & M real estate agency, prices within central Yerevan have increased by 100 to 150 percent in the past two years. A one-room apartment in the center goes for about $25-40,000; about $14-23,000 in the Komitas area and about $7-13,000 in Nork Massive and other outskirts. Residents such as Muradyan say they are being oppressed by North Avenue officials, but also by the courts who hear their appeals and, the residents claim, press them into signing unfair contracts. According to laws on amortization, the municipality has a right to buy out residential property if the purpose is deemed a special case meeting legal criteria. "It still remains unclear for us if the construction of the North Avenue can be qualified as a special case," complains resident Murad Avetisyan. "If yes, why do we have to pay a 10 percent tax to the government if our houses are being destroyed for the sake of the city." Residents contend there should be a new law to apply specifically in the North Avenue case, otherwise they should be exempted from paying taxes on the reimbursement of property. This is part of today's North Avenue . . . The construction of the North Avenue was warmly welcomed by Yerevan citizens, who expect the promenade to give the city a new image and a fresh appearance. And it is in fact an 80-year old idea that was part of city architect Alexander Tamanyan's overall scheme for building the capital. But it comes at the expense of 500 houses being demolished. Many of the houses in fact are in bad condition and it is likely that some residents can find more suitable dwellings but only if they are willing to purchase smaller places outside the center of the city. Generally, residents are being offered $250-400 per square meter of property, which will then be sold for $1,000 per square meter for business or residential property along the 24-meter wide pedestrian avenue. Rights to commercial lots have been sold at auction, and according to Yerevan Mayor Yervand Zakharyan only one 2,100 square meter lot remains unsold. The mayor also says that the city will make a profit of about $250-400 per square from sales. Residents of the area say the city's offers for their property are outdated. Within a few months after construction began in 2002, real estate prices that had been stable for years, sharply rose. If two years ago it was possible to by a three-room apartment for $30,000 in the city center, the same amount today would buy only a two-room flat. Officials say, however, that North Avenue construction is not the cause of the rise in real estate prices, but that prices instead are a sign of a general improvement in the republic's overall economic well being. Still, residents such as artist Sona Banoyan feel they are giving up too much for too little. She lives on Lalayants Street where she is being offered $60,000 for a 400-square meter property that includes two houses, a studio, a yard, and a wine cellar. She says she will agree to move for no less than $200,000.
. . . and this is how it's supposed to look in 2007..
"All my life my husband and I were cherishing our house," Banoyan says. "We worked hard to renovate it to make it as it looks now. For the money I'm offered, can I buy a property of the same size with all the conveniences we have now?" Banoyan is upset at city officials, but also accuses the media of making residents appear greedy. "The reporters show the half destroyed building, the garbage and say that people demand fantastic amounts for such property. Why has no one appeared in my house to show that it looks cozy and modern," Banoyan says. Vladimir Badalyan, a Parliament Member and liaison to the North Avenue residents, says residents are looking for their best advantage. "North Avenue is not a project, it has become a reality," Badalyan says. "The residents demand to freeze the project unless the government will reconsider prices. But the government also has obligations to businessman who sign the contracts and according to them the construction should be finished in 2007. I agree that some mistakes were made before starting the project, but now we do our best to satisfy the residents' need." Meanwhile residents say that those who refuse to take money and leave their houses risk losing both their property and the money because the court is on the side of the city. Some charge, too, that there have been occasions when residents who didn't want to move have been evicted and physically assaulted in the process. Officials at the North Avenue project office refused to comment to ArmeniaNow's questions about those accusations. Nor would officials there give any information on the current stage of the construction. Quite another inconvenience is faced by disabled Pushkin Street resident Rafik Hovanisyan. His house on the ground floor is the only chance to go out to the street. Now the family is being offered $10,000. Hovanisayn says he does not want money. He wants a house from where he can go out and get in without someone's help. First-floor units, however, are the first priority for businesses in the center and are considerably more expensive than higher units and not available for the amount Hovanisyan would be receiving.